Mosquitoes and ticks trapped in amber, still carrying ancient infections, yield important clues about the spread of vector-borne diseases. The microorganisms that cause malaria, leishmaniasis and a variety of other illnesses today can be traced back at least to the time of dinosaurs, according to a study of amber-preserved blood-sucking insects and ticks. In addition to demonstrating the antiquity of vectors and their long-term association with parasitic microorganisms, the findings are remarkable for several reasons. First, bloodsuckers like mosquitoes, fleas, sand flies, ticks and biting midges aren’t frequently found in amber, and rarer yet is evidence of any microorganisms they might have been carrying. But a review by entomologist George Poinar of Oregon State University showed that amber from five regions around the world contained hematophagous arthropods carrying preserved, identifiable pathogens and parasites. “Feeding on vertebrate blood evolved as an efficient way for certain insects and acarines to get protein for growth and reproduction,” said Poinar, professor emeritus in the College of Science and an international expert on plant and animal life forms found preserved in amber. 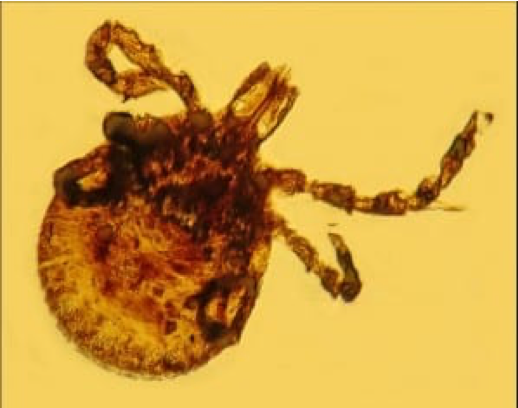 Poinar looked at bloodsucking insects and ticks encased in Dominican, Mexican, Baltic, Canadian and Burmese amber dating back from 15 million to 100 million years. Among the vectors were mosquitoes, sand flies, biting midges, bat flies, black flies, fleas, kissing bugs and ticks. They carry a cornucopia of microorganisms that today cause diseases such as filariasis, sleeping sickness, river blindness, typhus, Lyme disease and, perhaps most significantly, malaria. Malaria remains a relentless public health concern, with multiple nations reporting increases in infections for 2018. In Venezuela alone, Poinar notes, more than 650,000 new cases of malaria have been reported this year. “Numerous malaria species parasitize vertebrates today, and we now know that over the past 100 million years, malaria was being vectored by mosquitoes, biting midges, bat flies and ticks,” Poinar said. Poinar believes that the microorganisms first infected blood-sucking arthropods and only after equilibria had been reached between them were the microorganisms then vectored to vertebrates. “That topic has been and will continue to be under discussion for years to come,” he said.